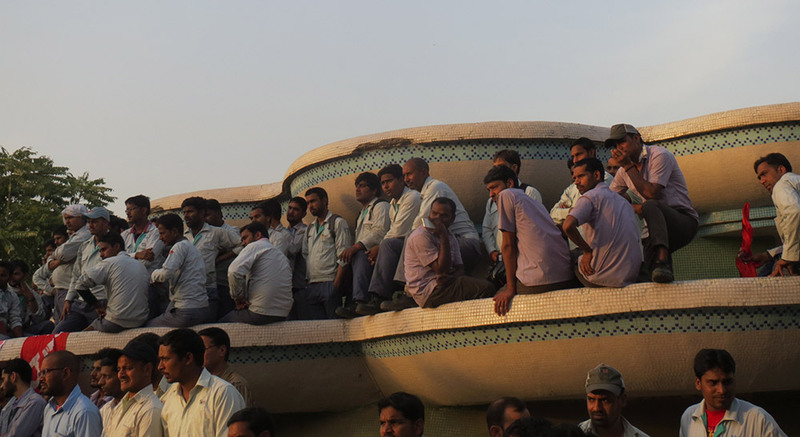 Hundreds of workers of Maruti, Honda, and more than 20 vendor companies protested in solidarity with the jailed workers on Thursday. On Thursday, hundreds of workers of automobile manufacturing factories in Manesar, an industrial town in Haryana’s Gurgaon district, staged a demonstration. It was a show of solidarity with 13 former workers of Maruti Suzuki India Limited who were handed life sentences on March 18 for the death of a manager during rioting at the plant in 2012. 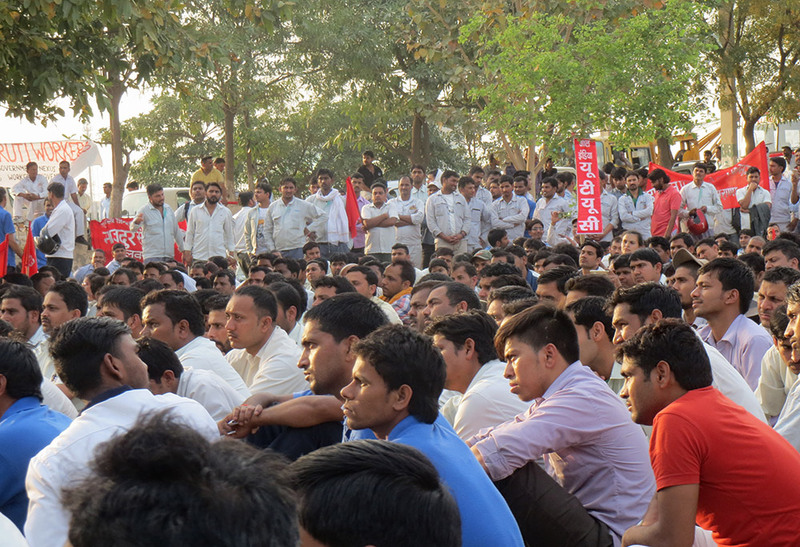 Permanent and contract workers (employed on seven-month contracts) of Maruti Suzuki and Honda Motorcycle and Scooter India Private Limited – which operate the two largest automobile plants in Manesar – joined the demonstration and public meeting, as did workers from over 20 vendor companies that supply automobile parts to both companies. Hours after the sentencing in a Gurgaon court, the Maruti Suzuki Workers Union, too, had organised a one-hour “tool down” protest at all four of the company’s plants and at two others owned by vendor companies. They have planned a national protest on April 4. 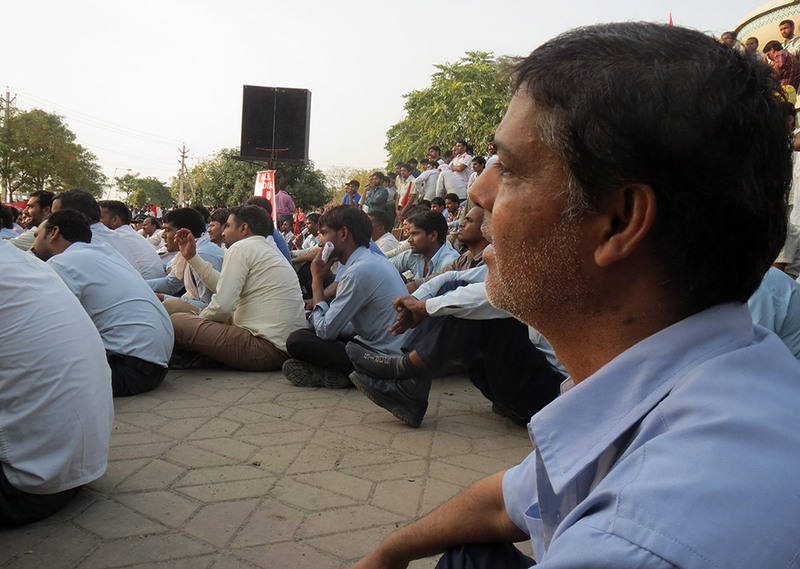 The Maruti Suzuki Workers Union leads a protest march with other plant-level and central unions in Manesar on Thursday. 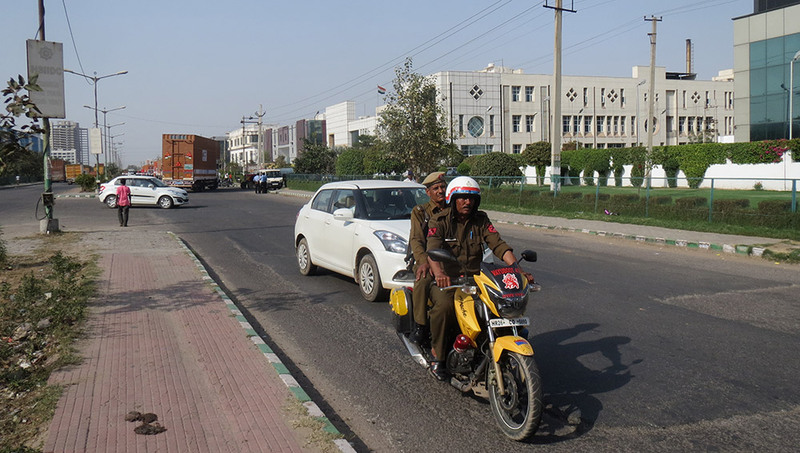 Manesar, 40 km from Delhi, has long been associated with protests and industrial unrest. It happened in 2011-’12, too, when thousands of Maruti Suzuki employees struck work thrice demanding better conditions, a new union, and equal employment terms for permanent and contract workers. As a result of the intermittent strikes over a year, Maruti Suzuki – India’s largest automobile manufacturer – suffered a loss of Rs 2,500 crores and saw a 6% drop in its market share. The workers registered the Maruti Suzuki Workers Union in February 2012. But five months later, on July 18, their conflict with their employers turned violent over their demand to reinstate a suspended worker. In the rioting that followed, senior manager Awanish Kumar Dev died of suffocation in a burning building with multiple fractures in his leg. Several other managers were injured. On March 18 this year, the Gurgaon additional district and sessions court sentenced 13 workers – all 12 members of the union and the suspended worker, Jia Lal – to life imprisonment, having pronounced them guilty of Dev’s murder on March 10. 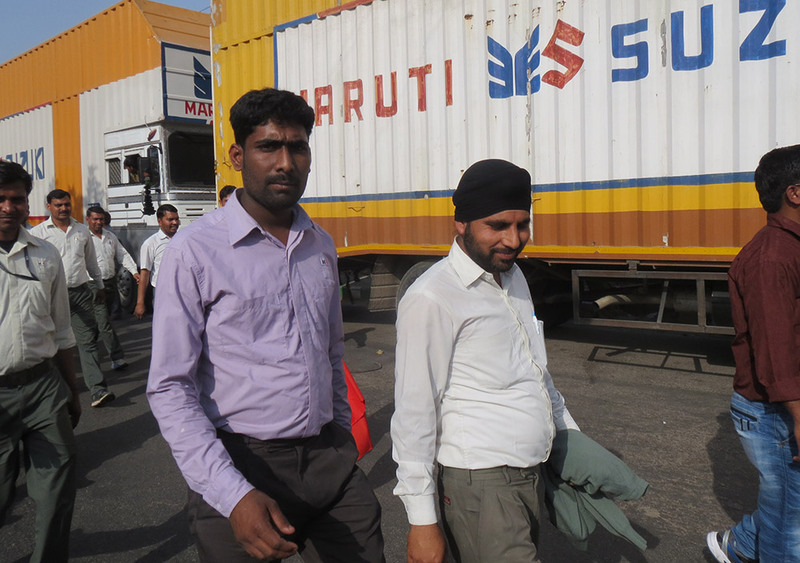 It acquitted 117 other Maruti workers after they spent more than four years in prison. Police presence in the industrial town was strengthened in the run-up to the court verdict in the Maruti rioting case. Nihal Kumar Singh, wearing the violet uniform of a Maruti Suzuki contract worker – they constitute two-thirds of the company’s workforce – said he believed even the managers knew the verdict was unfair. Permanent and contract workers of Maruti Suzuki India Limited march to show solidarity with their convicted former colleagues. 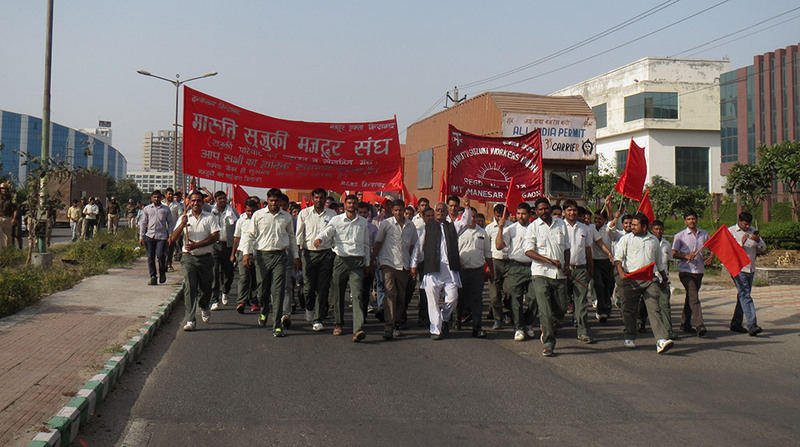 Gursharan Singh, a permanent employee with STI Sanoh India Private Limited Manesar, which supplies brake pipes to Maruti Suzuki, joined the demonstration, marching through Manesar with 15 of his colleagues. He, too, said the verdict was the government’s and industry’s way of “telling workers not to form unions”. But he added that “many unions and associations have been formed in the past five years, by Belsonica Auto workers, at Satyam Motors, and several others are in process”. A permanent worker with STI Sanoh India Private Limited Manesar, a vendor company for Maruti Suzuki, joins the public meeting after working the morning shift. Workers from over 20 vendor companies that supply automobile parts to Maruti and Honda joined the demonstration. 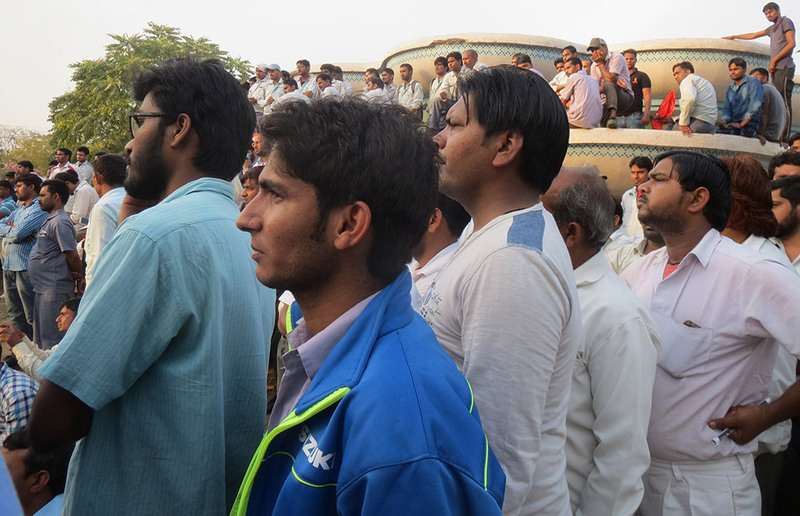 Employees of FCC Rico and other vendor companies expressed solidarity with the 13 convicted Maruti workers. The factory workers maintained they have legitimate grievances and work in difficult conditions. In most plants, the assembly line is geared to produce a car every 50 seconds to 60 seconds, leaving those manning the line with little opportunity to take a break for even a few minutes during their eight-hour shifts, they pointed out. “Most workers are hard-pressed and under constant pressure,” said Ravinder Sharma, a 20-year-old temporary worker with Maruti whose job is to stand in one place and install an engine part every time a car rolls off the assembly line, 490 times a day. “I weighed 65 kg when I joined, and I probably do not weigh even 50 kg now,” he said. “One week you work on a shift that starts at 6.30 am, and the next week you are on a shift that ends at midnight,” he added. “By the end, you cannot sleep anymore, whether it is day or night. If you fall ill, you do not want to take more than two [days’] leaves in three months, or the ‘good work’ component of Rs 3,100 will be deducted from your salary.” Sharma is paid Rs 13,500 a month, a third of what permanent workers earn. Most automobile manufacturing plants prefer hiring the majority of their workers on seven-to-nine-month contracts. The permanent employees have their own complaints. They pointed out that after the 2012 incident, the company had started hiring the majority of its workers on seven-month contracts, which made coordination between permanent and temporary staff difficult. 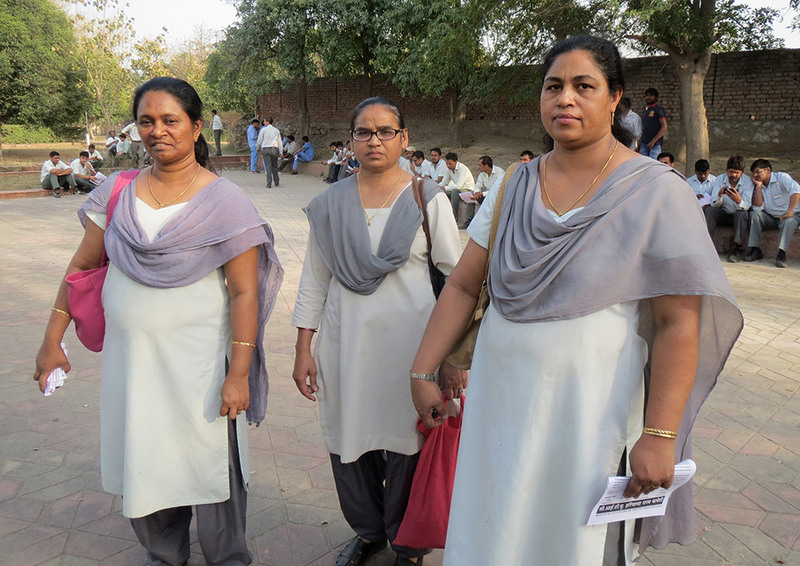 Maruti's temporary workers in their violet uniforms. They form two-thirds of the company's workforce. Ram Kumar, who works with a two-wheeler plant in Manesar, hired through a thekedar or contractor. 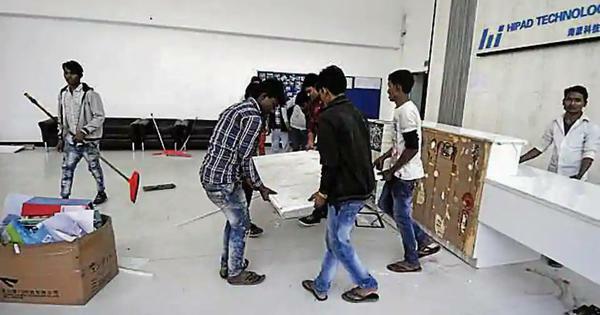 “The company removes us every year and then makes us re-join by sending an email,” said the 24-year old who moved to Manesar for work from Agra. He has been a contract employee at the firm for seven years through this system. Omax Auto has denied that the 35-year-old worker committed suicide because he was dismissed from work. It has stated that Pandey had been unwell since September, and had been missing from duty without notifying his employer. All images by Anumeha Yadav.